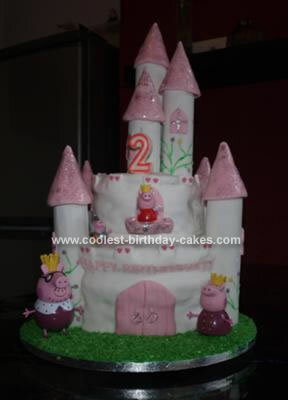 This Peppa Pig Princess Castle Birthday Cake was made for a friend’s 2nd birthday. It was my first attempt at making a birthday cake and I thought it came out quite good. The cake is made from 2 cakes to create the main castle and then has 7 torrents covered in edible glitter. The cake also sits on grass made from colouring coconut. I finished it with some Peppa pig figures.